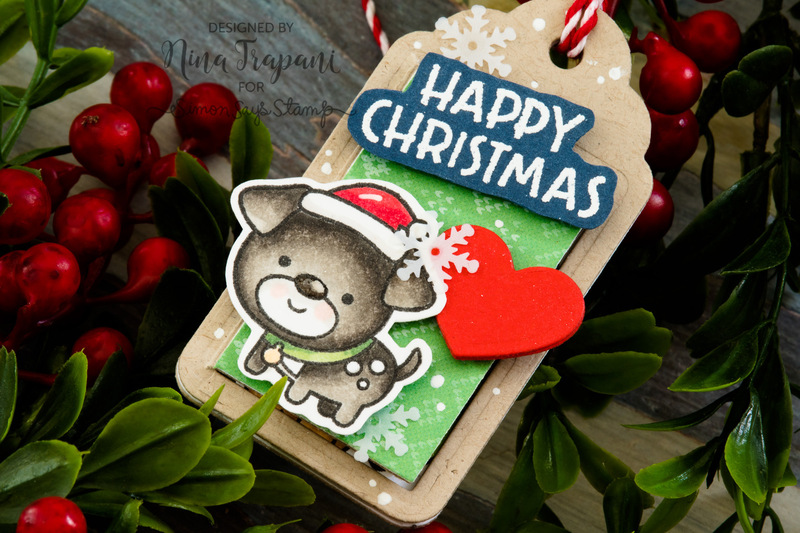 Home | Blog | Studio Monday with Nina-Marie: Holiday Tags 5 Ways! 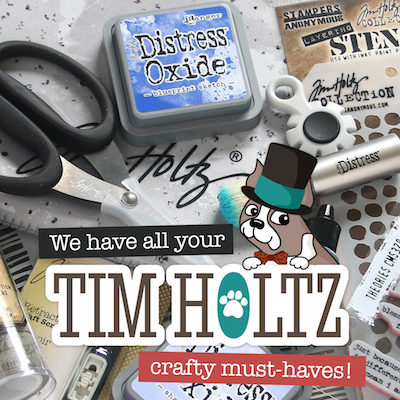 Hello crafters, welcome to the latest edition of Studio Monday! 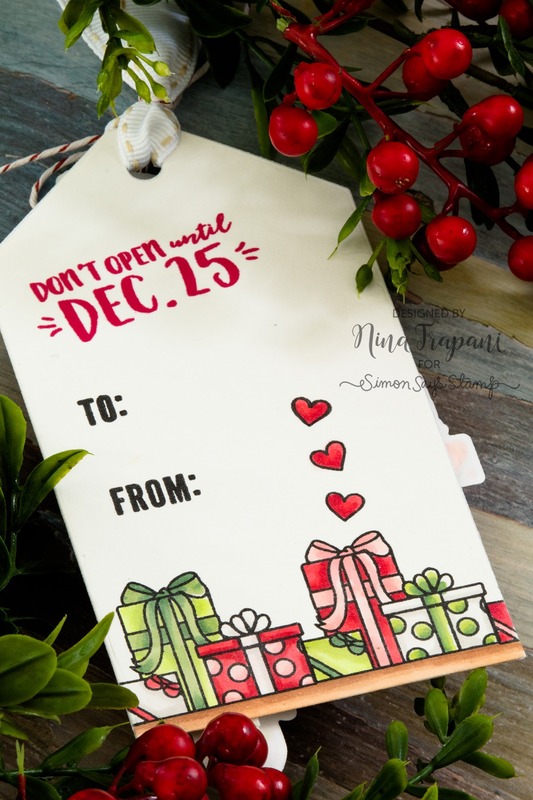 Today I’m sharing five unique ways to create one-of-a-kind and easy tags to use on Christmas gifts or even to attach to cards! 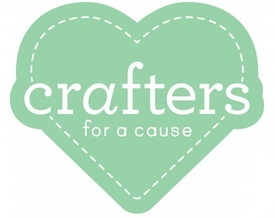 The first tag I made features a cute, shaker element! 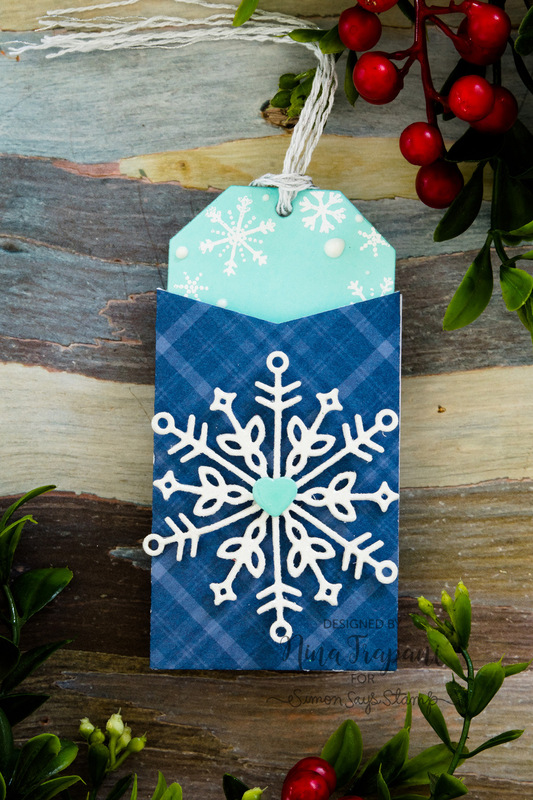 I used our Simon exclusive Snowflake Tags die set and cut the tag with white cardstock, as well as the Lawn Fawn Knit Picky paper collection. Inside the shaker are Snowflake confetti pieces and Christmas Carnival gems, plus a bit of white glitter paper in the background; the shimmer is stunning! For the sentiments I used the CZ Design Merry script die with a heat embossing Christmas sentiment strip. A bit of twine and ribbon finished off this sparkly, shaker tag! 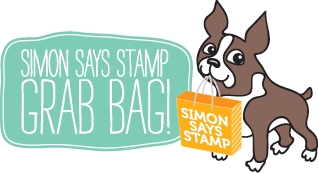 This playful tag features the fun, Fanciful Tags die set that is exclusive to Simon Says Stamp! I paired this with images from the Christmas Squad stamp set, plus papers from Lawn Fawn’s Knit Picky and Really Rainbow Christmas paper collections. The greeting on the tag is from our Simon exclusive Merry & Bright stamp set, and I included a few Hero Arts snowflake confetti pieces around the tag too! Be sure to watch the video below to see what I put on the inside of this peek-a-boo tag! The Holiday Cheer die set from Concord and 9th makes the most darling pocket tags; with both the pocket, the tag and a bunch of festive shapes, you can make unique tags that are sure to add a bit of cheer to your Christmas gifts! I created quite a few of these tags, as they were so much fun to make! Most of the tags feature the Holiday Cheer coordinating stamp set, but I also used the Simon exclusive Big Joy Snowflake die on one of the tag pockets. After making the pocket tags, I wanted to feature the darling Elves and Their Shelf stamp set from Neat and Tangled with some Pebbles Candy Cane thickers. The images are colored with Copics, and I neutralized the adhesive on the back of the letter thickers so that I could pop them up with foam tape. 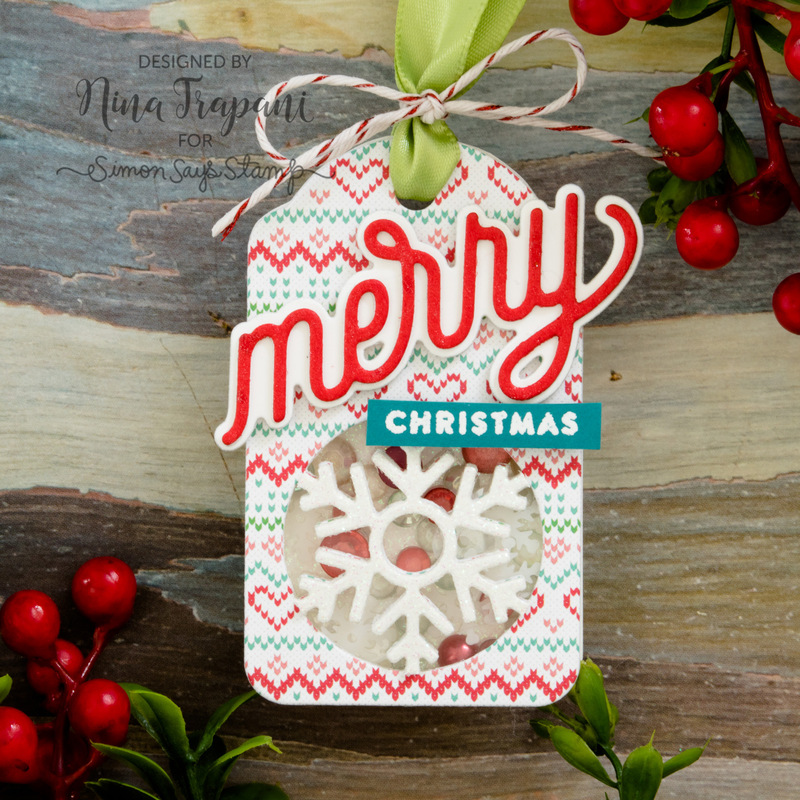 The tag itself was created from the Build a Tag die set by Neat & Tangled. On the back of the tag I stamped gifts and sentiments from the Elves and Their Shelf set. Isn’t this tag awesome? The other cool aspect about this uber-dimensional piece of holiday-happiness, is that it is BIG! 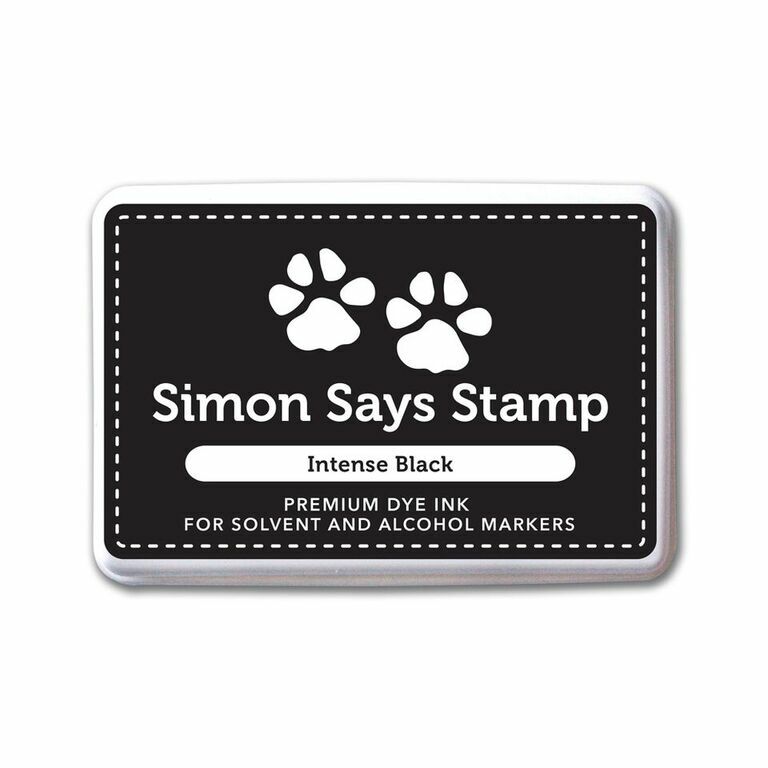 The tag itself measures 2.75″x5″… that’s a lot of area to decorate! Finally, my last set of tags is something that can be adapted to fit ANY holiday themed stamp and cordinating die set! For my tags, I used the beautiful Ornate Ornaments set and colored the images with Copic markers. Using the coordinating die set, I cut the images out along with a second set of plain white die cuts; those pieces I layered behind the colored die cuts. This hides the bleeding of the Copic marker coloring, giving the tags a clean, finishing look. These tags are so quick and easy to make, you can put together a ton of these in no time at all! I hope that all of these ideas have inspired you to create some beautfiul tags of your own for your holiday packages, treats and more! Be sure to watch the video to see more details on how I made these tags! This is great Nina-Marie, love them all and you inspired me to use this also on a card. Thank you so much for the great 5 ways serie. What cute tags! 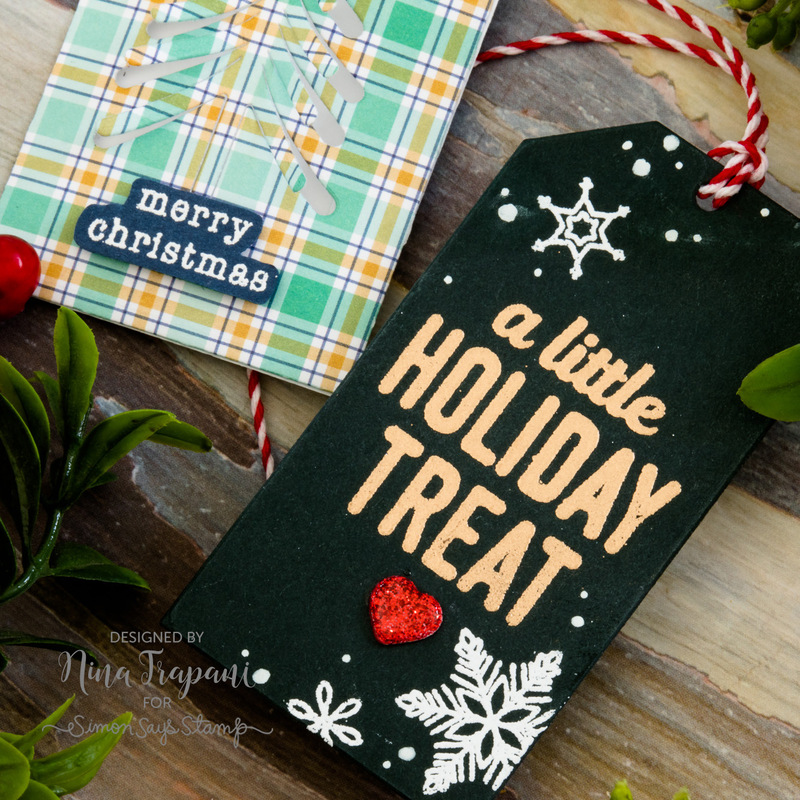 The oversized Ho Ho Ho tag is cute enough to be a card! Love these- thanks for the video! Great tags. Love them all . Thank you for the great tips. One year I gave bundles of handmade tags to several friends. They loved them. I love the ideas you’ve shown here. They will be fun to make, fun to give and fun to use! Thank you! What wonderful tags. Love the bright colors and textures! 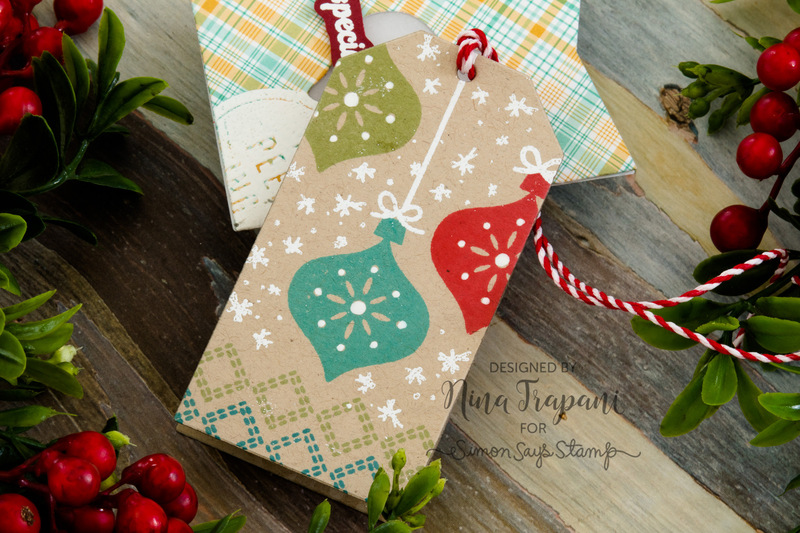 What a delightful set of holiday tags…thanks for sharing them, Nina-Marie–and thanks, too, for the video tutorial. These tags are DARLING! 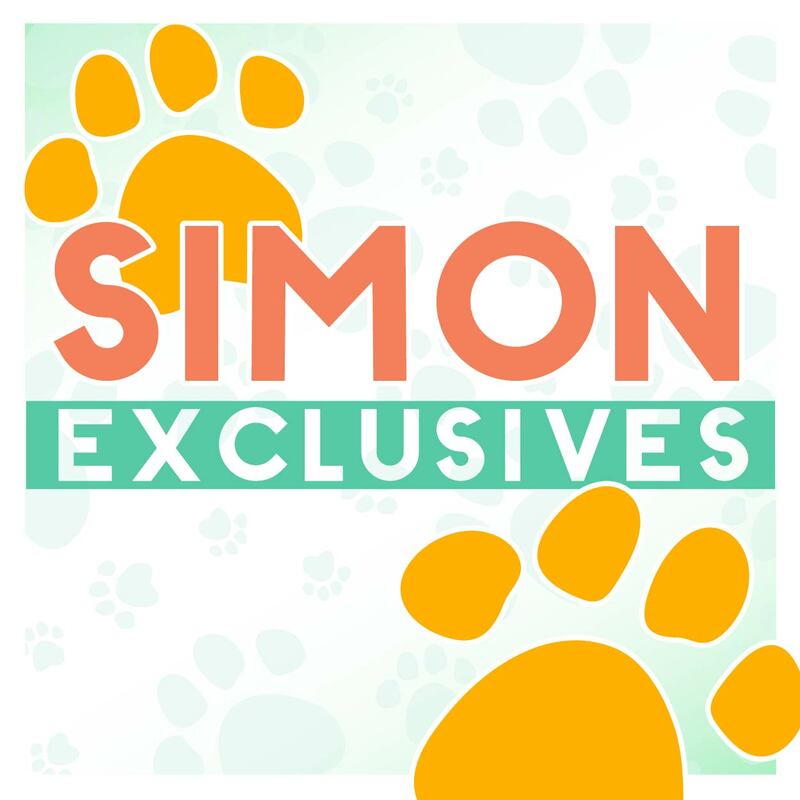 I love all the different colors and cute images! Such wonderful inspiration for making festive Christmas gift tags. Nina-Marie never fails us with great ideas. Thanks for showing us your marvelous tags!! I’ve made a few tags, but I’ve never had my act together enough to mass produce. Perhaps this will be the year! Whenever I do, this will be a really useful post. Thanks, Nina. All your tags are fabulous but I particularly like the ornament ones! Great inspiration Nina! 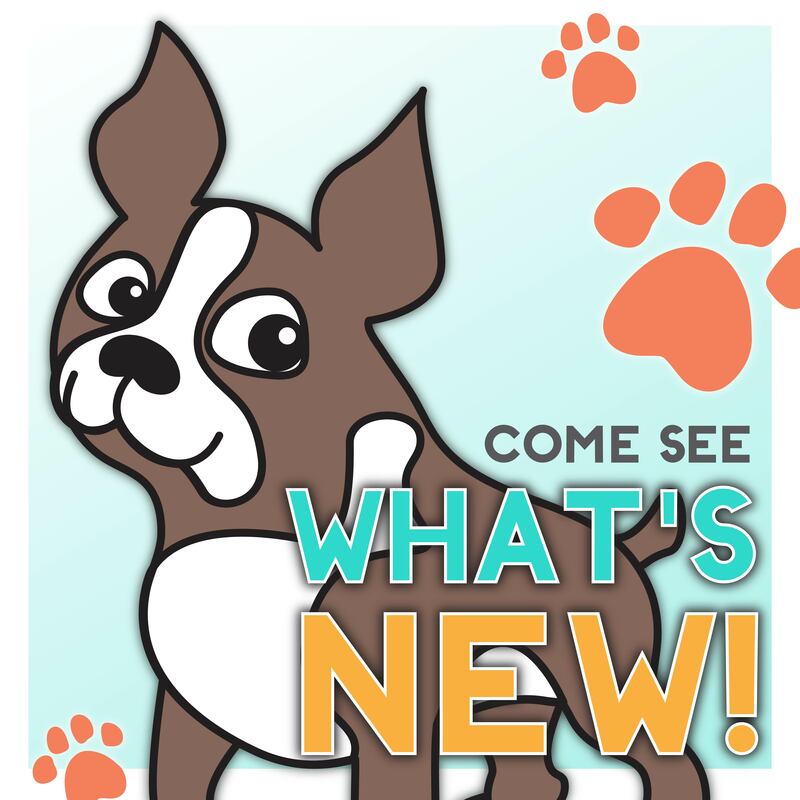 The puppy and kitten peek a boo was so cute and I loved the coloring you did on the ornaments. I am ornament obsessed. Great job! Love all the tags Nina-Marie. The puppy one is my favorite! Beautiful job on these tags. I have a big crop coming up on Friday and one of the things in the “goodie bags” is some hand made tags. I had a ball making them. Thanks for sharing yours with us. So many fun tags! Love them all! Wow, so many ideas to make tags! I appreciate the inspiration so I can get started on my Christmas tags. Terrific tags! Love the variety! OH, oh, oh, these are all so adorable!! Cute variety of tags. 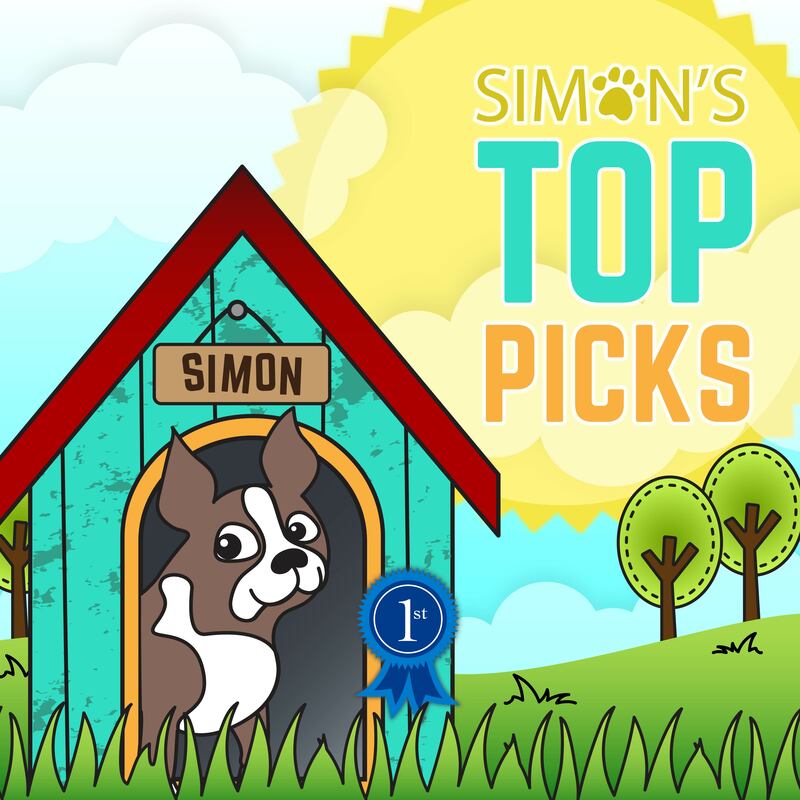 Hard to pick a favorite but that dog is so cute. These are all so cute. 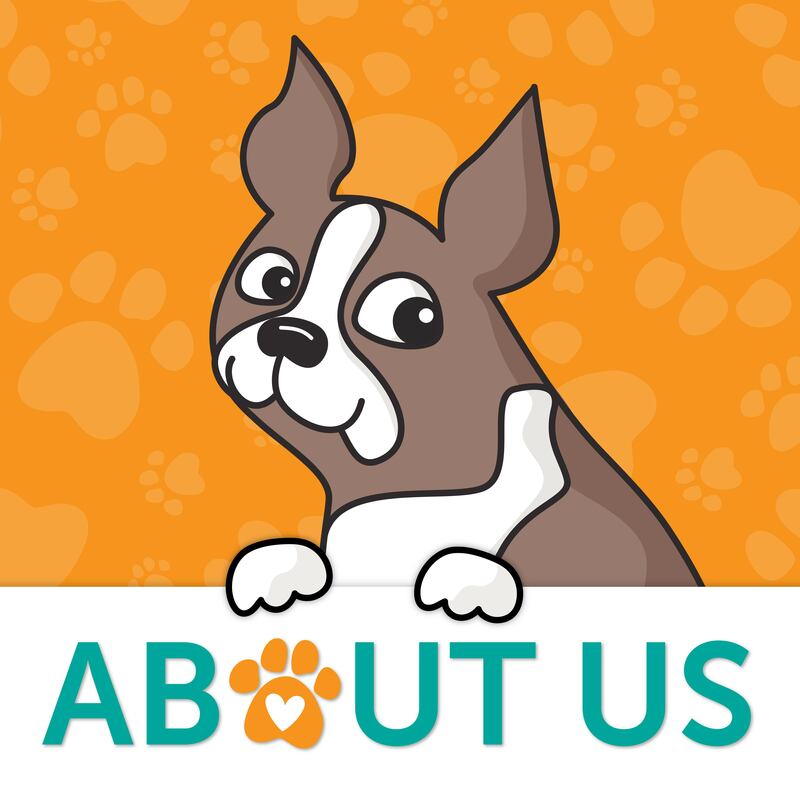 But the puppy and kitty one is my favorite! 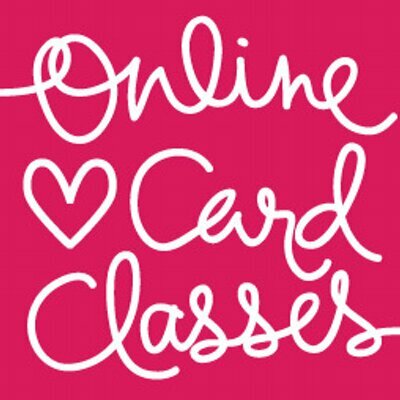 I like studying and I think this website got some genuinely useful stuff on it! I definitely love the tag with the Holiday Cheer ornaments. Simple designs and vibrant colors, perfect!